It’s awesome to know that your clients have more faith than you do when it comes to the types of cakes they ask for. 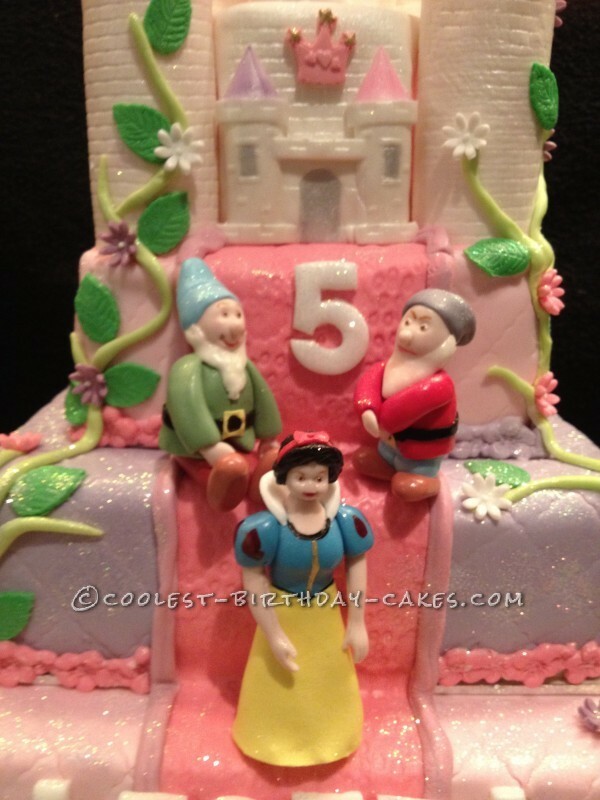 Well this was one of those when I had a client asking me for a Snow White and seven dwarfs 3 tier cake with a castle on top and prince charming waiting at the bottom of the stairs. 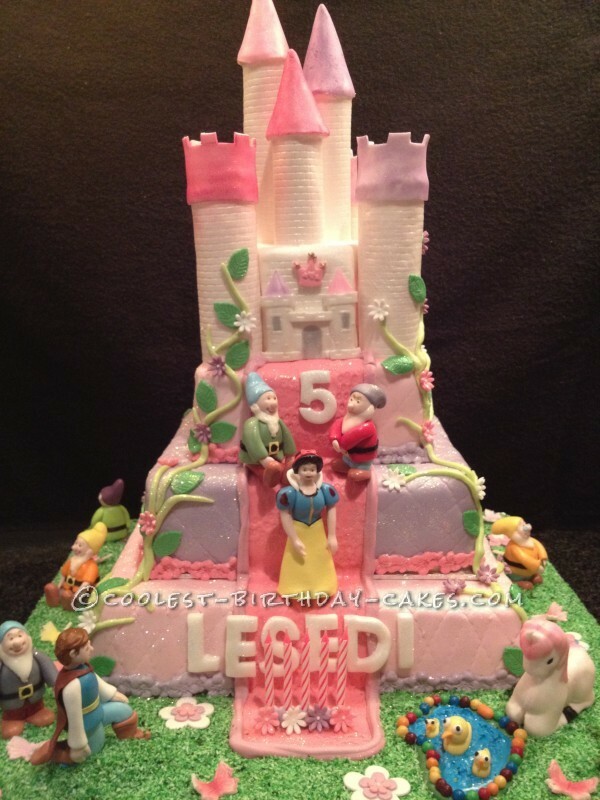 I was sent 3 different cake pictures and when I received them thought OH NO, how am I going to do this fairy tale cake. It was to feed 100 + people, so I was pretty worried how it was going to travel. Having said that I set to work. I mixed the food coloring I was going to use into my fondant which I was going to use to cover the cakes a week before which was pink and very light purple. 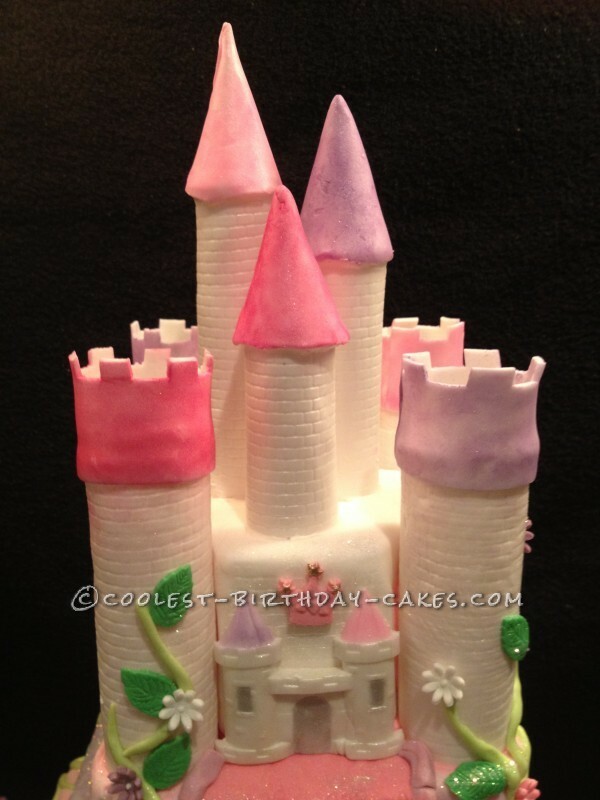 I made sure all the figurines, castle and flowers were made a week before out of fondant, with the help of a very talented friend , and then set to work. I made a 14 inch, 12 inch and 10 inc square cakes. The 14 inch was a chocolate sponge, the 12 inch was marble (chocolate and vanilla sponge mix) and the 10 inch was vanilla sponge, all had caramel filling in the middle of each cake (the sponge recipe is from my gran who is 93 years old). Then I made my butter cream icing from stork bake margarine, vanilla essence and icing sugar. Once I had done that, I got my board I used, an 18 inch board as there was going to be a lot of decorating on the board as well. Once my cakes were cool and I had cut each one in the middle and filled with the caramel, I covered them in the butter icing and it was time to roll out the fondant to go onto each cake. 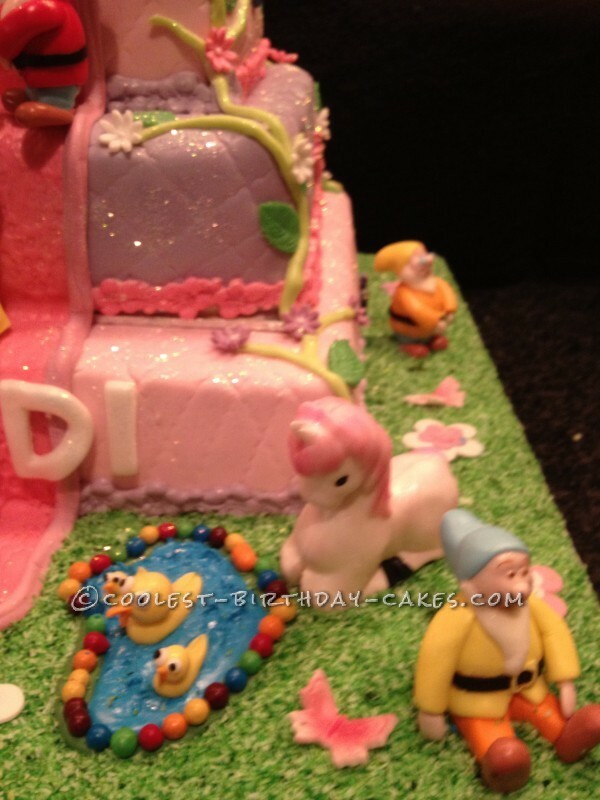 Wow, did I battle with the 14 inch fondant lol. I had bruises all up my arms the way I used the rolling pin to roll the fondant out (wish I had one of those big industrial rollers, lol). Once I had covered my first cake, I got Del sticks and measured how high I would need each one for the bottom of the cake (you will need 4). I then put them into the bottom cake got some royal icing (made from egg white and icing sugar), put some on the top of the bottom cake and once I had covered the second cake put it onto the 14 inch cake. I put the 12 inch right up against the back one so the front looked like it was a step. And then did the same for the 10 inch onto the 12 inch. Once the cake was put together the fun part started and that was deciding where all the flowers, butterflies, pond, 7 dwarfs, Prince charming, unicorn, and Snow White were all going to be. After 11 hours on this cake which started at around 8pm till 2am the next morning and then carrying on from around 8 am till done. My beautiful creation was finally done. It was the most amazing feeling for me to know that yes, I can deliver amazing work and to believe and trust in myself more. Now there is no stopping Amazing Yummie Mummie cakes.